The Magnificent Upscale Brigadune Direct Oceanfront Condominium Complex is situated on a peninsula and overlooks the Atlantic Ocean providing for spectacular breathtaking ocean views. 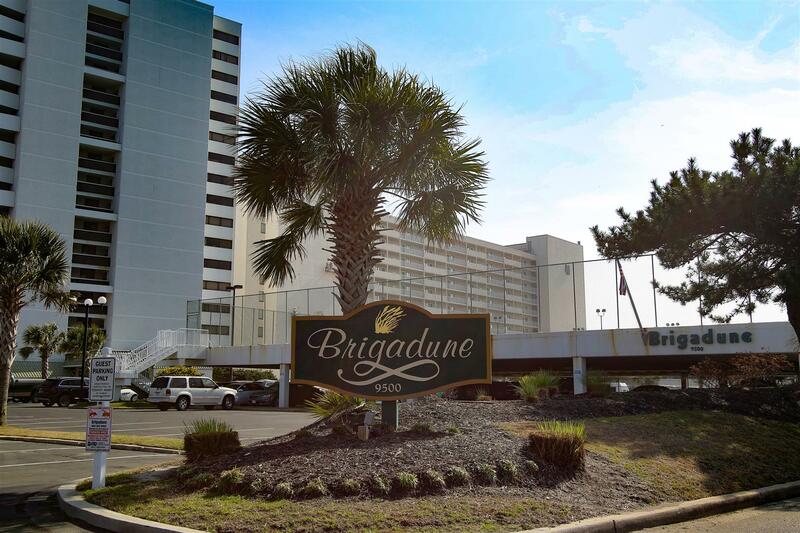 The Brigadune is located on the quiet and prestigious Shore Drive, between Myrtle and North Myrtle. Just South of the Kingston Plantation, North of Marriott's Grand Dunes and directly behind the famous Dunes Country Club. 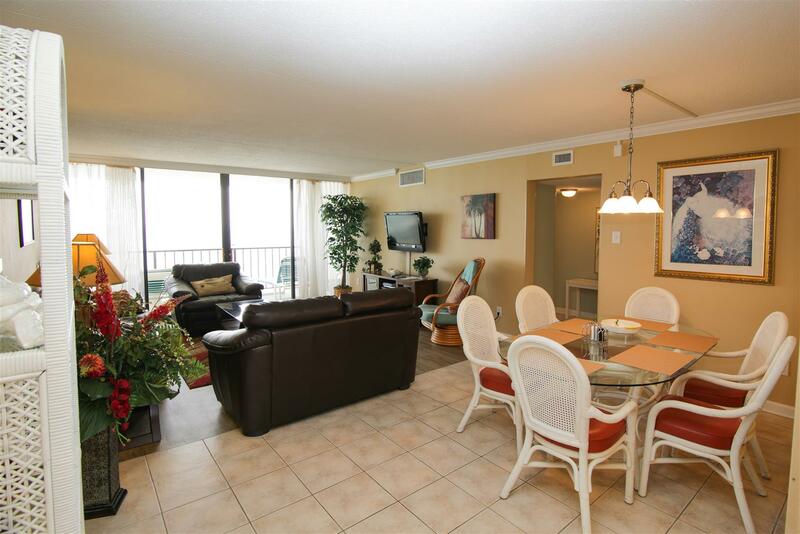 Brigadune is a beautiful property that has large oceanfront balconies with over sized sliding glass doors to enjoy the views from either inside or outside the condo. You can enter the balcony from either the spacious living area or master bedroom. Large dining area for entertaining and fun game nights are sure to be a hit! "The property was very nice in a great location. We loved the balcony. " "Great condo for a ladies weekend getaway. Great location away from the congestion. A couple beach bars and restaurants within walking distance. Kitchen is decent. Furniture in living area needs reupholstering and is uncomfortable. Owner has placed covers over each piece." "As always had a great stay at the Brigadune. And the weather was so much better than forecast so we were really happy about that. " "We stayed in unit 14D and they have a very comfortable king size bed, albeit a little high even for a 6 man. This unit is considered a premium unit however it could use an upgraded toaster, a frying pan bigger than the existing 6, oven mitts, and the couch is wearing considerably. Perhaps consider updating your on-line photos. This property is very well maintained and the on-site staff are friendly and helpful. The vacation staff are also wonderful to deal with and very accommodating. This is not our first time staying at Brigadune and we look forward to returning." "Loved the location! Nice to have a keirug. Very nice rental awesome balcony view." "We stayed at Brigadune 14D during a recent trip to Myrtle Beach. We loved the Oceanside location and appreciated that it was close to amenities yet away from the touristy hub. The unit itself is spacious and comfortable. The double doors leading to the balcony were a highlight as was the nicely appointed master bedroom. Suggestions I would give to management would be to include a fitted sheet with the king linen package. The king mattress, while quite comfortable, also did not have a mattress pad which made the flat sheet provided a little more difficult to work with. Another linen suggestion - I would have loved to have seen dish cloths provided along with the towels. Furniture was comfortable, though the pleather on the couch is showing signs of wear. Overall the unit was quite satisfactoy but a few little extras would have made it perfect. " "We come here at least twice a year and it's always a fun trip. The unit is well maintained and after trying several units this is the one we try and reserve each stay." "Well appointed beach front condo. Comfortable bed and furniture. We loved it! Brigadune is in a great location. Staying in 14D was an extra treat, as we had a terrific view of the dolphins swimming in the ocean, too! We will certainly stay here on our next trip to Myrtle Beach." "We have always stayed at heron point condos in the past and decided to stay at brigadune on the beach this time and it was well worth it. the condo was beautiful and you just can't beat the location. will be back again in the futuren"
"The entire place was very nice. Very clean and updated carpeting recently. 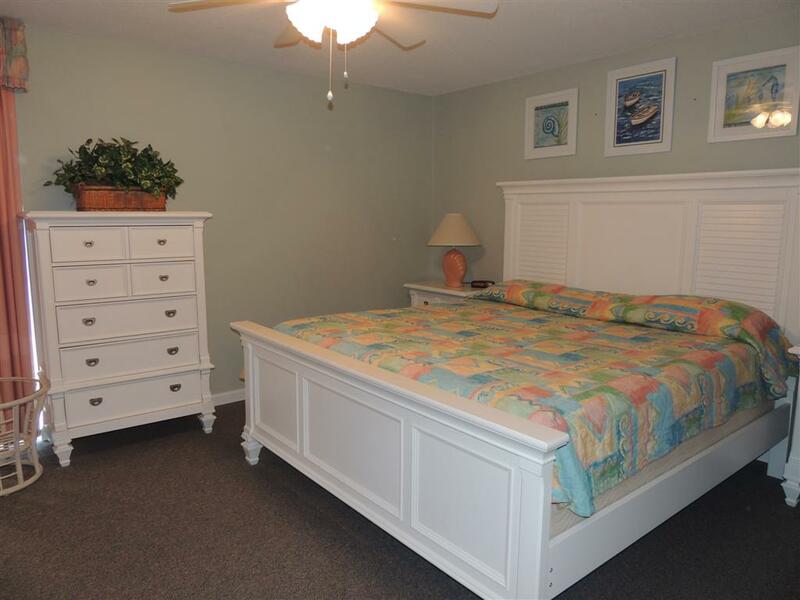 Nice balcony and living arrangements "
"We have used Myrtle Beach Vacation Rentals on several occasions and consider it our go to people for a no hassle vacation. They always seem to go that little bit further to make you happy. The staff are very friendly and helpful." "Property description is accurate. The oceanfront condo was clean and spacious. " "The only problem we experienced was not being able to get in our first night. The keys we were given wouldn't turn the lock. After the second call to the emergency number, I received a call and then housekeeping came and let us in. Of course we couldn't leave that night, but luckily we had been to the grocery store. The next morning I had to go get new keys which still didn't work properly, but a locksmith came that afternoon and we had no more problems. Love the location and the condo:) "
"We stayed over thanksgiving weekend and the condo was perfect. Great location, beautiful view, and most important to us it was immaculately clean! You can't beat the price for an oceanfront condo. It truly looks just like the photos, it's our new go-to condo. The staff was excellent, we had questions about checking in/out during non business hours and they have everything arranged for you with no worries whatsoever. We will stay again for sure!!" "Desirable location. Unit was fine but not spectacular. Elevators were a bit of a hassle but nothing terrible. View was great and everything worked as advertised. " "I have stayed on Shore Drive for over ten years. This was one of the nicest condos I have stayed in. It was well decorated and the kitchen was fully equipped with a Keurig, and plenty of pots/pans, silverware, and dinnerware. I was impressed. " "We decided to get away for a few days prior to the new school year beginning. We found the condo to be nice with the exception of the kitchen. The kitchen was a collection of mismatched pots, pans and utensils which made cooking a challenge. Overall a nice stay. " "The Downie's stayed at Brigadune 14D on July 4th through July 11th and had the time of our lives! We love Brigadune! This is our second year staying there and if God willing, we hope to stay there next year! The condo is beautifully decorated, fully equipped kitchen and very comfortable beds. The view was gorgeous with a big balcony entrance from the living area and master bedrooms. It was very quiet, no disturbances and very convenient to restaurants, shopping and attractions. The only complaint, was the rental company told us the condo was clean and ready and when we got there it was not. We called and a person came quickly to clean and was very apologetic. I would like to see the condo be ready sooner than 3:00, that would help us a lot! Over all, brigadune is the best condo we have stayed yet on Shore drive, and we have been coming to myrtle beach for over 20 years! Come to Brigadune, you'll love it! Thank you owners of unit 14D for sharing your condo and maintaining such a beautiful home! "I really enjoyed will be back next year"
"We are happy to stay here, by seeing the pic's online was little bit worried, but once seeing the apartment it's too good, may be need to update new pics. All Amenities are very good. " "My family and I absolutely enjoyed our time at this vacation home. Our family travel yearly and this home is now one of our favorite places we've ever stayed. The home was in perfect condition, rooms large and comfortable. The view breath taking. Great choice we made!" "Had an absolute blast!!! This was our second stay at the Brigadune. We are planning for a third trip in September." "My husband and I needed a relaxing vacation and found it at the Brigadune. We thoroughly enjoyed our time there and will plan to return.We loved the spacious rooms and being right on the beach." "the few things that needed attention were taken care of pronto." "We stayed in Brigadune 14d in May 2013. Overall we enjoyed this stay. The condo itself was more than enough room for my husband and I and our toddler son. The room was clean and neat. The travel company was friendly and accomedating. we would stay here again"
"Not enough soap for a ten day stay. The blankets were pretty mangy. A hair dryer would be nice." 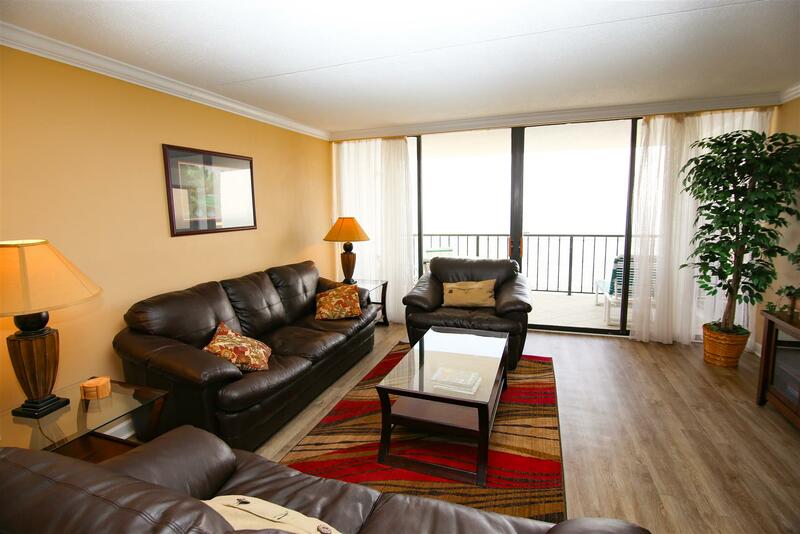 "The condo was very nice with a great location. I will say that some strange man walked into the condo to clean the air conditioner filter. This was really one from the rental agency contacted us ahead of time to give us a "heads up". Also, the mattress pads and blankets need washed. Aside from that, I would rent again through the agency and the same condo. Very spacious and well equipped (don't forget hot pads and kitchen towels...there are none there)We had great weather and fun!!! Fishing out back in the back area is great!!" "We love the location of the Brigadune! The condo was very nice. I felt the tile floor could have used a good scrubbing. They could also use a new sweeper in the condo. Overall though I would stay there again. The rental company was also wonderful to work with!" "excellent service by Emma Floyd"
"I had the most enjoyable time. I would do it again in a heartbeat. The only problem was that one of the resident complained about the music but that only happened once. Other than that, I had a ball. Thank you for a wonderful week. See you next year!" 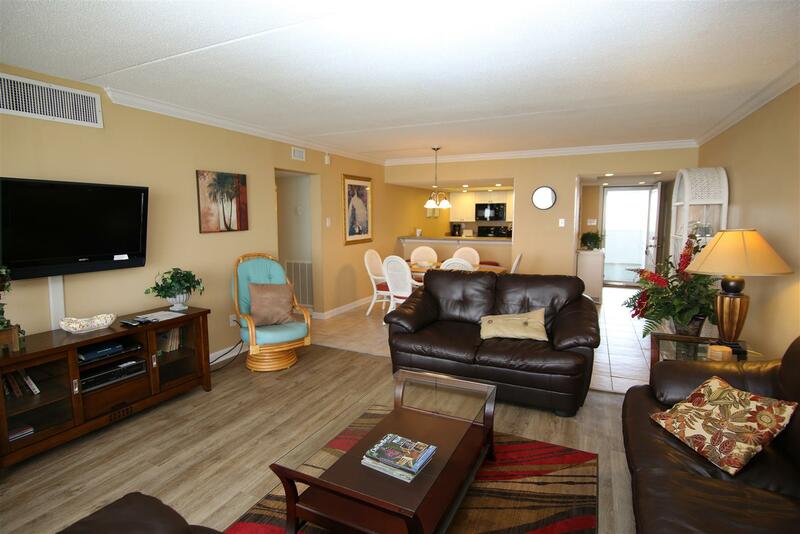 "Condo was nicely furnished, lots of room and the grounds were spotless. Highly recommend this condo." "Emma is always very helpful and professional !" "Exceptional place to stay! The property was clean. The view was great. I defenitly would stay there again. "I was disappointed that I paid for linens and didn't have any dish cloths/towels. Would have been nice to have a few more bath towels/cloths provided. Lovely condo." "This was the best stay we have had as far as rentals go. IT was very spacious well equiped, Ocean front view and view in back is great too!Unit is right off of elevator easy access to everything. Master bedroom is very nice , new furniture it looked like. King size bed. Second bedroom was nice had 2 twin beds the one I slept on could use a new mattress, but was very spacious. Over all the unit was Very nice! The pool area was nice also. Well maintained and landscaped. We look forward to staying there next year!" "It was a very nice week. everyone very friendly and clean.."
Fill in the fields below and click the arrow.